Bijouxs is all about sharing and this month it’s some favorite Bijouxs Basics, the classic recipes that endure the test of time. 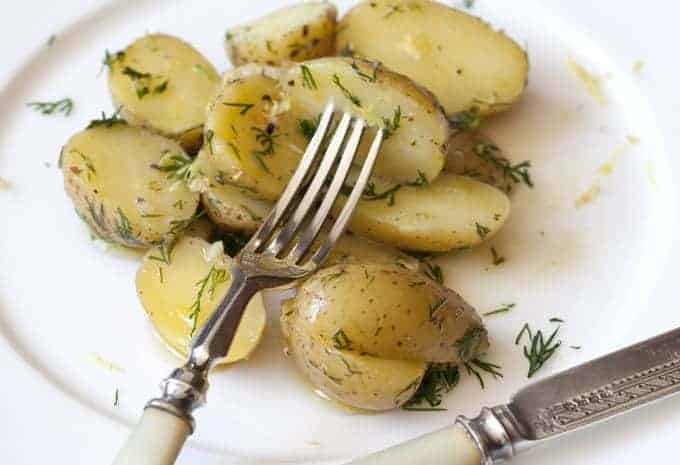 Potato Salad, the perennial favorite, goes golden and light with lemon, dill, olive oil and a even gets a bit saucy courtesy of Bijouxs. This Bijouxs Basics is from the archives, a random recipe in the treasured Bijouxs three-decade collection – no name, no date, just the details. The details for Potato Salad with Lemon & Dill are amazingly simple, but that’s no surprise at Bijouxs. 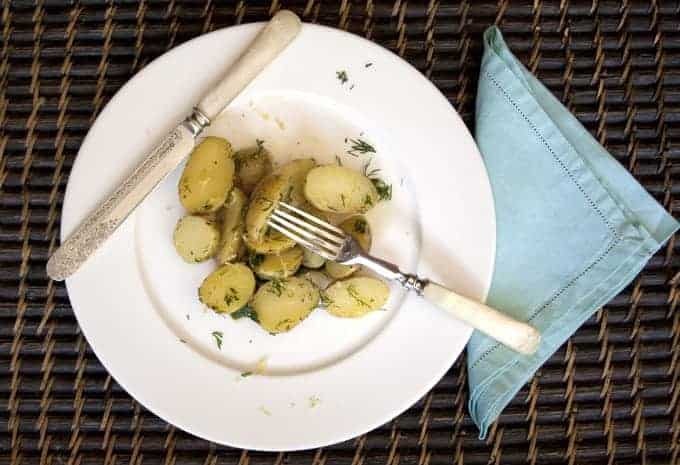 A light, olive oil based potato salad bright with sunny fresh flavors yet providing the edible calm and comfort that only a potato can bring. Begin with lovely yellow little potatoes. These buttery yellow little jewels are Piccolo potatoes from The Little Potato Company, via my friends at Frieda’s Produce and conveniently available at Ralph’s markets. Bijouxs frequents the farmers markets every week, but also enjoys the fact that specialty produce is becoming more available at the supers, which many nights becomes a stop on the way home from work, just reality. Gather some fresh dill, a few lemons and this simple salad is almost home. 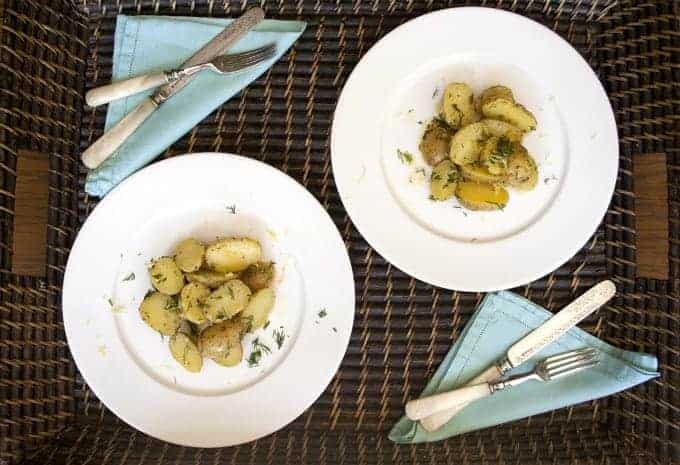 Tiny little jewel potatoes cook quickly in their jackets and slice easily while still steamy warm, opening themselves up to be dressed in the sunny flavors of lemon, Dijon, golden olive oil, garlic, along with the tart green snap of fresh dill. 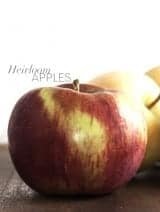 The ingredients to create the dressing are quickly brought together with basic kitchen hand tools – a knife, a favorite wooden citrus reamer and a lemon zester offer their assistance. Sometimes Bijouxs gets a bit saucy if it’s an all grown ups meal and sprinkles the hot potatoes with just a splash of vermouth right before bathing them in their golden dressing. 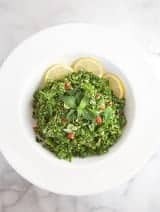 I favor serving this salad immediately after preparing while it is still warm, but also you may make the salad ahead of time, refrigerate and then later serve at room temperature. On the rare occasions where there may be a small amount of the potato salad leftover, I have combined the potato salad with eggs to create a brunch frittata, draping the cooked frittata with thin slices of smoked salmon, crème fraiche and a sprinkle of fresh dill. 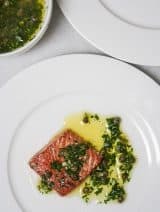 Most often I pair this sunny and satisfying potato salad with simple grilled salmon or chicken, a big green salad and complete the meal with fresh fruit. 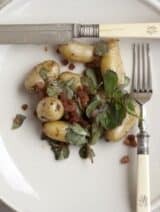 September is a month of cooking up Bijouxs Basics, a potato salad with a sunny disposition and as always, sharing the little jewels from my kitchen to yours. I almost always use lemon for my raw salads. But for boiled potatoes, I do away with my favorite citrus extract. I think, I may have to vary that a little after seeing your recipe. 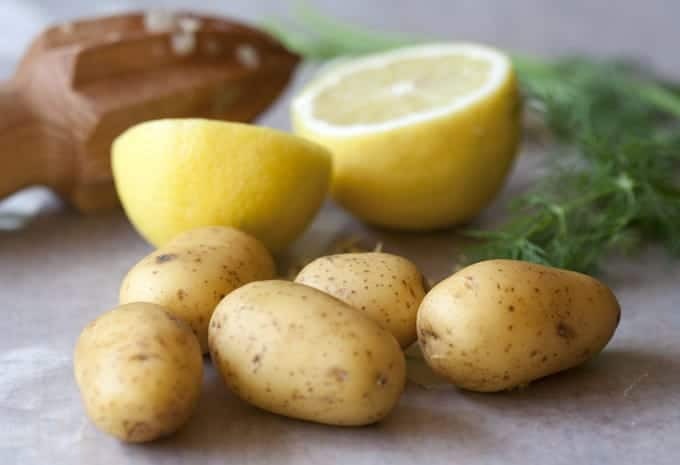 Lemon adds that same bit of freshness to the cooked potatoes, balanced by the rich olive oil & hint of Dijon. Thanks for stopping by Bijouxs! I make a very similar potato salad with dill and vinaigrette, but have never used lemon! It’s with the same vinaigrette I just described in your last post. Once again, you have me intrigued and I will have to try it your lemony way! 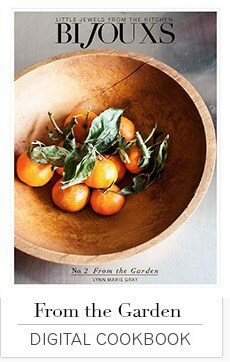 You may know by now Bijouxs is citrus crazy and this salad remains a basic for its sunny lemon disposition. Thank you Lentil Breakdown! 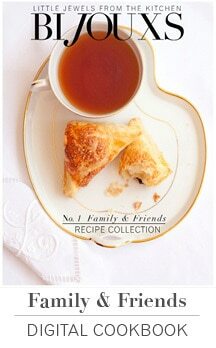 Hi Greg – Yes, dress ’em warm is the key and enjoying them while still warm is delicious. Thank you!